You’ve made the decision to purchase an investment property and after some preliminary number crunching, you’re considering marketing it as a fully furnished luxury rental. If you have done your research and your analysis is in the right ball park, you will have realized that on average, you can earn anywhere from 25% to 50% more rent using a furnished rental business model. Furthermore, depending you how you shop for furniture, this 25%-50% margin should be enough to offset the initial cost of the furniture within the first 2 years. The majority of these potential tenants will prefer a central downtown location, and this is where you should be looking to purchase. Experience shows that locations south of Bloor Street, in between Sherbourne Street and Bathurst Avenue enjoy the highest demand. Secondary to that, any location along the Yonge subway line (for example, Yonge and Eglinton or Yonge and Sheppard) can also perform well. Type of Property – again considering your target market, an easy to manage property with hotel-style amenities (such as a fitness center, swimming pool, concierge, etc.) is your best bet. Specifically, a condominium in a relatively new building is preferable to any other type of property. The only disadvantage with condominiums is that they are subject to monthly maintenance fees. These fees are used to pay for the building amenities (and sometimes include your energy costs), as well as grounds-keeping, snow removal, building maintenance, etc. Also, a good portion of the maintenance fees are placed into a reserve fund which is set aside for major unexpected building repairs. 1. Work with a knowledgeable property manager. Even if you are looking to manage the property yourself, most property managers will be happy to chat with you about what they see as important characteristics for an investment property. This is important information you can obtain for free. Furthermore, some managers offer a consulting service where they will help you choose a property, even if you want to manage it yourself. However, if you are planning to use a property manager to manage your property, click here for more information on how to evaluate property managers. 2. Find a dependable and reputable real estate agent with experience in furnished investment properties. As a buyer, a real estate agent’s services are free for you. Some agents may even offer a financial incentive for you to use their services. 3. Leave emotion at the door. For example, you can prioritize your criteria and evaluate each potential property based on those criteria. One way to do this is to rank units by using a “scorecard” with marks for each criteria and then compare each unit’s score against the purchase price. • Your expected annual cash flow. This is calculated as your gross rental income less all on-going expenses. Expenses include your mortgage payment (if any), condominium maintenance fees, insurance premiums, property taxes, etc. and B = your total initial investment (down payment, land transfer tax, legal fees, cost of furniture, etc). Download this excel spreadsheet which calculates estimates for both of these performance measures (based on various assumptions and inputs). Note that these two measures often move in opposite directions. For example, in a situation where you make only a small down payment, your ROI will be high because the denominator (B) will be smaller. However, your cash flow will suffer because of your higher monthly mortgage payment. The reverse is also true. You must decide which is more important to you (ROI or cash flow) given your long-term investment objectives. 5. Start small to minimize risk. While it is true that larger, more expensive condominiums can generate higher rents and higher returns, keep in mind that risk and reward always go hand-in-hand. For example, should you experience a period of vacancy, the carrying costs are higher for a more expensive property. 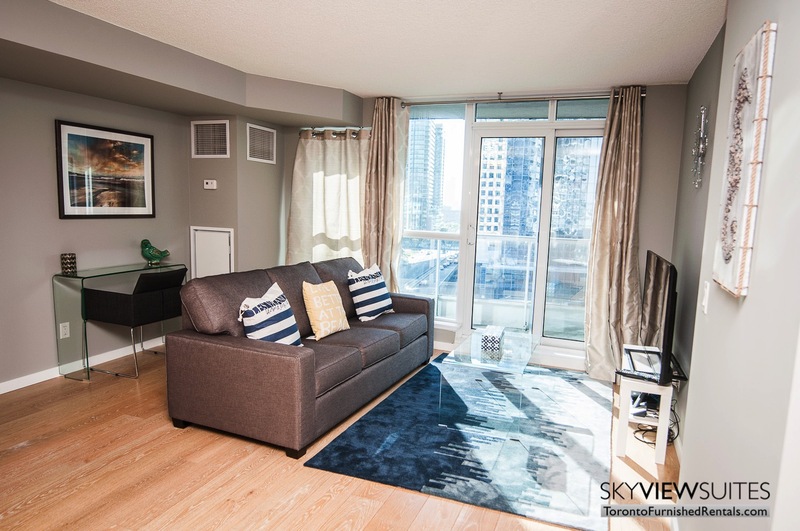 If you’re just looking to get your feet wet in the furnished market and want to minimize your risk, consider starting off with a bachelor / studio condominium. 6. Detach yourself from your personal tastes. When it comes to décor and furnishings, neutral is the way to go. Think of it this way – if several different prospects view your property, it’s better to have all of them score it an 8 out of 10 than half of them score it a 10 and the other half score it a 6. Remember, your tenants’ tastes are different from your own, but so long as there is a netural look and feel to the décor, you should be able to maximize your occupancy rates. 7. Watch out for maintenance fees in new buildings. In newly built or pre-construction condominiums, maintenance fees often start off low (as they are initially set by the builder in order to entice pre-construction buyers) and then creep up quite quickly to a more realistic level after the owners take possession of the building. This risk exists with established buildings as well, but if a building is run well and has been in operation for a few years, maintenance fees should increase at a slower pace. If you are purchasing pre-construction or in a relatively new building, consider the number of units in the building. Buildings with more units or buildings that are part of a larger complex can spread certain fixed costs (such as concierge and building management services) over a larger number of units, resulting in lower maintenance fees. 8. Make sure you’re not violating any building by-laws. Most condominiums have a 30 day minimum rental rule, however some have longer minimum rental periods. You should obtain this information before a purchase and ensure it does not conflict with your plans for the property. 9.Consider the long term. Due to the high transaction costs involved in any real estate deal and the short-term volatility of real estate prices, real estate is more viable as a long-term investment than a quick way to make money. 10.Don’t forget parking. Not having a parking spot will affect the marketability of your unit. You could potentially be closing the door on 60%-70% of the furnished rental market by not offering parking. The alternative would be to rent a parking spot in the building and market it together with the unit, but the simpler solution would be to purchase a unit that already has a parking spot.